Scorpion sting is an acute life-threatening, time-limiting, medical emergency of villagers and is a neglected public health problem in tropical and sub-tropical countries, especially in India. Mesobuthustamulus, an Indian red scorpion, is the most lethal species of the Buthidae family in India. Most of the stings are harmless and follow a benign clinical course, but morbidity and mortality due to scorpion stings result from acute refractory pulmonary edema, cardiogenic shock and multi-organ failure. Previously, many drugs were used in the treatment of scorpion sting but, following the advent of the alpha-1 blocker prazosin, the fatality rate has been reduced. We report a case of a 9-year-old boy with "red" scorpion sting who developed acute pulmonary edema and cerebral infarct with motor aphasia. The pathophysiology of this complication is not well known and probably, is the consequence of hypoxia, secondary to respiratory failure, laryngospasm and seizures that are manifestations of envenomatiom by scorpion sting. A 9-year-old male child with a history of "red" scorpion sting was initially admitted at a private clinic where he had one episode of hematemesis and developed pulmonary edema and hypotension. He was later referred to our hospital on Day 3 for further management. On admission, the patient was in respiratory distress with heart rate 180 beats/min, respiratory rate 58 cycles/min, oxygen saturation 80% on 5L of O 2 , blood pressure 90/70 mmHg with bilateral crepts in the chest and frothing from the mouth. The patient was intubated and was given ventilator care. 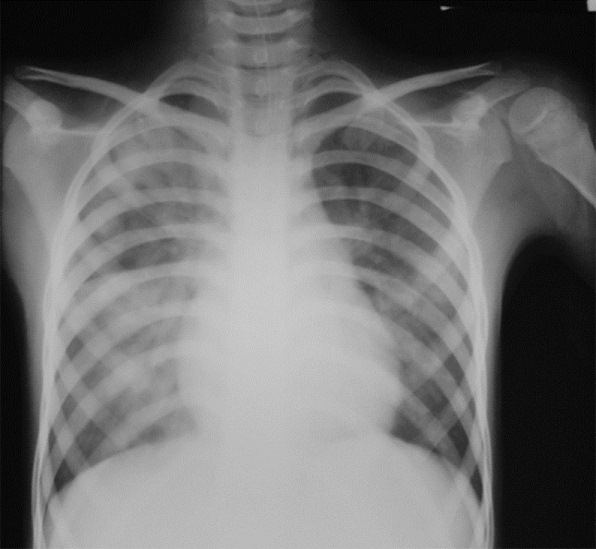 The chest X-ray was suggestive of pulmonary edema [Figure 1]. After hospitalization, the condition of the patient improved and he was extubated 6 h later, but, on Day 3 of admission, the patient developed bilateral ptosis and right-sided supranuclear facial palsy with motor aphasia. He was investigated, and showed a hemoglobin level of 11.3 g/dl and total leukocyte count of 9,000/cu mm with 85% neutrophils and 15% lymphocytes, erythrocyte sedimentation rate of 12 mm/h and normal peripheral smear with platelet count of 254,000/μl. Urine had no albumin and microscopy was normal. Examination of the cerebrospinal fluid was normal and tuberculin test was negative. Echocardiography (ECG) was performed to rule out cardiac dysfunction, which was normal, and ECG showed rate-related nonspecific ST-T changes. An ultrasound of the supra-aortic region was normal and troponin was negative. Rest of the biological assessment was normal, with no abnormalities of hemostasis. Magnetic Resonance Imaging (MRI) was done, which showed in FLAIR images, hyperintense areas in the superior, middle and inferior temporal gyri, pre-and post-central gyri and supramarginal and angular gyri on the left side [Figure 2] a and b, showing a corresponding area of high signal intensity on diffusion-weighted images indicating restriction of diffusion [Figure 2]c. These findings are consistent with early infarct and cytotoxic edema in left temporal and parietal lobe in distribution of terminal branches of the left middle cerebral artery. After symptomatic treatment and inotropic support, the condition of the patient gradually improved. He was then started on low-dose aspirin and steroids. The facial palsy and ptosis improved on the 6 th day with persistent aphasia. The patient was discharged in stable condition with persistent motor aphasia on the 8 th day of admission. Scorpion sting is prevalent in few parts of the world, and is a major health problem in the Konkan areas of Maharashtra. Of 1500 scorpion species, 50 are dangerous to humans. Scorpion sting causes a wide range of manifestations, from several local skin reactions to neurologic, respiratory and cardiovascular collapse. The scorpion venom is a water-soluble, antigenic, complex mixture of neurotoxin, cardiotoxin, nephrotoxin, hemolysin, phosphodiesterases, phospholipases, hyaluronidases, histamine, serotonin and other chemicals. By opening sodium channels at the presynaptic nerve terminals and inhibiting calcium dependent potassium channels, the neurotoxin, which is the most potent of the toxins, can cause continuous prolonged, repetitive firing of somatic, sympathetic and parasympathetic neurons. Autonomic storm is characterized by transient parasympathetic and prolonged sympathetic stimulation. In most circumstances, the sympathetic response predominates, resulting in sympathetic storm. Arterial hypertension, tachycardia, myocardial dysfunction, pulmonary edema and cool extremities have been attributed to stimulation of alpha-receptors by the scorpion toxins. In regard to mechanism of scorpion venom in pathogenesis of respiratory failure and pulmonary edema, Comellas et al. concluded that it decreases clearance of alveolar fluid probably secondary to down-regulation of sodium and potassium adenosine tri-phosphatase in the alveolar epithelium. Sympathetic complications are not uncommon but central nervous system complications (CNS) are rare, comprising only 2% of all complications. The toxicity and clinical picture are related to species differences and venom dose/weight relationship. A World Health Organization publication states that antivenoms are among the few pharmacological agents in widespread use today whose therapeutic value remains largely untested by clinical trials. Al-Asmari et al. reported that polyvalent antivenom may not be beneficial in all cases of scorpion envenomation, and prazosin may be effective as an alternate. Bawaskar et al. reported the effectiveness of prazosin, demonstrating that the mortality rate was reduced to 1% as compared with 30% in the pre-prazosin era. There has been only one other reported case of motor aphasia as a complication of scorpion envenomation. In cases of envenomation by scorpion sting, the effects on the CNS are unclear; although the penetration of the toxin through the blood-brain barrier is poor, certain authors agree that the toxin acts directly on the neuron, producing encephalopathy and contributing to the occurrence of seizures. An increase in blood pressure secondary to sympathetic stimulation is also mentioned, which could cause hemorrhages, brain edema and cerebral infarction. The acute dyspnea on the night of scorpion sting could have been due to pul==monary edema. The associated hypotension possibly precipitated the cerebral ischemia in the already compromised carotid circulation due to vasospasm. The cerebral infarcts, clinically evident 36 h after envenomation, are compatible with low-flow infarcts, which are known to develop and progress gradually over days or weeks. Scorpion sting envenomation is a life-threatening emergency in children and timely referral and early therapy may be life-saving. The authors are thankful to Dr. Manal Ahmed and Dr. Zeeshanuddin Ahmad for their immense help and technical support. 1. Patil SN. Research on scorpion sting-anti platelet drug use in hemiplegia after scorpion bite. Available from: http://www.swamisamarth.com/hospital/research/research_1_1.html. [Last accessed 2012 May 05 th ]. 2. Razi E, Malekanrad E. Asymmetric pulmonary edema after scorpion sting: A case report. Rev Inst Med Trop Sao Paulo 2008;50:347-50. 3. Bawaskar HS, Bawaskar PH. Efficacy and safety of scorpion antivenom plus prazosin compared with prazosin alone for venomous scorpion (Mesobuthustamulus) sting: Randomised open label clinical trial. BMJ 2011;342:c7136. 4. Comellas AP, Pesce LM, Azzam Z, Saldías FJ, Sznajder JI. Scorpion venom decreases lung liquid clearance in rats. Am J Respir Crit Care Med 2003;167:1064-7. 5. Gadwalkar SR, Bushan S, Pramod K, Gouda C, Kumar PM. Bilateral cerebellar infarction: A rare complication of scorpion sting. J Assoc Physicians India 2006;54:581-3. 6. World Health Organization. Progress in the characterization of venoms and standardization of anti-venoms. Geneva: World Health Organization; 1981. p. 8 (WHO Offset publication no 58). 7. Al-Asmari AK, Al-Seif AA, Hassen MA, Abdulmaksood NA. Role of prazosin on cardiovascular manifestations and pulmonary edema following severe scorpion stings in Saudi Arabia. Saudi Med J 2008;29:299-302. 8. Bawaskar HS, Bawaskar PH. Utility of scorpion antivenin vs prazosin in the management of severe Mesobuthustamulus (Indian red scorpion) envenoming at rural setting. J Assoc Physicians India 2007;55:14-21. 9. Raichur DV, Magar VS, Wari PK, Chandragouda DK. Hemiplegia and motor aphasia following scorpion sting. Indian J Pediatr 2001;68:669-70. 10. Romero NO, Hernandez TJ. Cerebral edema associated to scorpion sting: A two case sting report. J Venom Anim Toxins Incl Trop 2005;4:594-600. 11. Yanagihara T, Sundt TM Jr, Piepgras DG. Weakness of the lower extremity in carotid occlusive disease. Arch Neurol 1988;45:297-301.